The Premier Plus Reclining Bathlift allows you to choose the most comfortable bathing position by reclining the back up to 40 degrees and can be stopped at any point. It features a heavy duty base that provides maximum stability and support and comes with comfortable, machine washable fabric covers. The unit has a 375 lb. weight capacity. 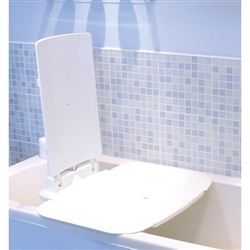 All battery operated bath lifts manufactured in the last 5 years have rechargeable batteries in the hand control. When the battery can no longer hold a charge, the hand control must be replaced - typically every 3 - 4 years. One advantage to the AquaJoy bath lifts, is that the cost of a new hand control is less than half of most other bath lifts. Although the initial price of an AquaJoy bath lift is slightly higher than some other lifts, the cost of owing the bath lift over a 10 year period is less than most other lifts. Note: This product is a hygienic item and can not be returned if the box has been opened. Seat height range: 3.1" - 18.1"
Heavy-Duty seat and base provide maximum stability and support. Include a safety feature that will not lower the individual into the bathtub unless there is sufficient power to raise the user back out of the tub. Makes getting in and out of the bathtub safe, simple and worry free. Fully waterproof, floating battery hand control with easy to use convex and concave operating buttons. Easy release suction cups on base provide maximum stability in the tub. Simple to understand charging process. AquaJoy bath lift battery/hand control (BL130) Now in Stock! If I could give this company six stars I would! It took about a month and multiple phone conversations for me to decide on the Premier Plus, and it's working out great. Mark was so patient with all my questions, and he presented a couple different options. He clearly was most interested in meeting my needs and not just making a sale. The primary reason I went with this lift is because it reclines and can lift 375 lbs. It's great to be able to take a bath again and not worry about getting up. I selected this lift because it was the most affordable lift that reclines for folks that weigh more than 300 lbs. I like the lift - it works well. Hopefully it will last a long time!